Another customer special from the LaidBack showroom – I grabbed a few photos of this awesome RaptoBike Midracer in hub-geared/open cockpit configuration before it went out. 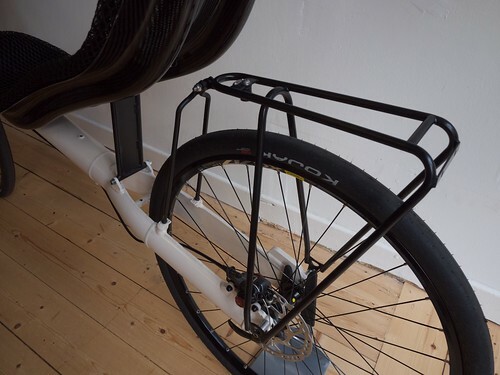 The clean lines of the RaptoBike lowracer have clearly been inherited by its taller brother, but in this case the Midracer is even cleaner, with no boom to break up the bike’s outline (the frame adjusts by lengthening and shortening at the mid-section join). This particular frame also has no front derailleur post, a bit of an obstacle for general use but with the Alfine 11 hub gear, unnecessary. The larger idlers on this FWD help mitigate the high angle of deflection. Unfortunately, it also contributes to the phenomenon known as ‘Raptobite’, if you aren’t careful! The Alfine 11 with chain tensioner. 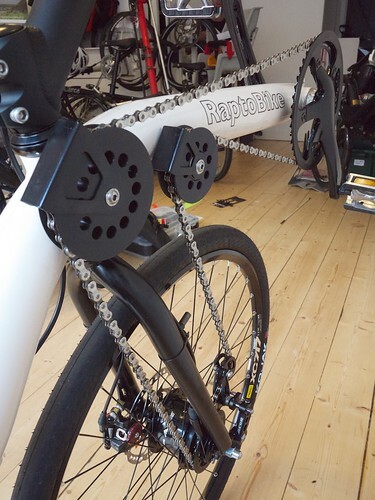 A decent amount of spare chain is vital on all Raptobikes as turning the handlebars increases the distance between the cassette and BB: you only need a few links, but without them you wouldn’t be able to turn! The bike was equipped with Avid BB7 disc brakes, which are practically an industry standard: powerful and easy to adjust. Overall, a nice, clean, and very different bike – ready for fast day rides with some luggage capacity. May it see many sunny miles! 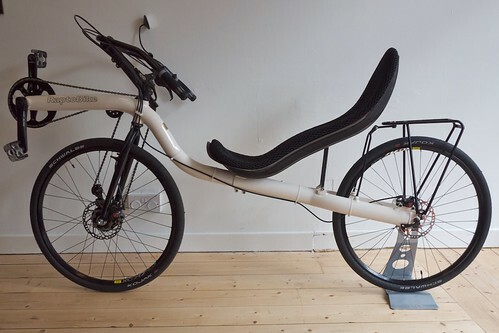 I have a detailed write-up of the ‘normal’ Raptobike Midracer, click here! I had decided I was going to get a RB Mid racer (for practical reasons even though I had secret desires for a Low Racer) before David G had an ex demo Low racer for sale. I must say whilst I am very happy with the LR I still like the lines of the MR and I particularly like the fact that there is no boom and that it can be split in half quickly as I would struggle to get the LR in my car without some disassembly. Not sure about the open cockpit bars and the chain tensioner looks like a bit of a complicated arrangement, however I can’t say that I’m not just a little bit envious. Looking forward to the MR ride report. Hi, I’m the proud new owner of the pictured Mid-Racer. 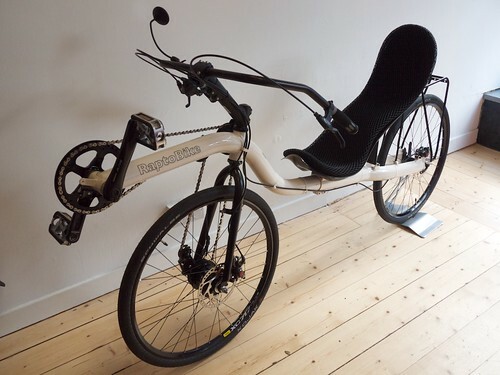 My previous recumbents include, AVD Windcheetah, a Mike Burrows RatRacer SL (Alfine8 FWD), a horrible Cannondale, an equally awful Challenge Hurricane SL, an unrideable FWD Cruzbike and most recently, a very exotic Bacchetta Carbon Aero 2. I also currently run a rather lovely Circe Tandem (Alfine 11speed) for the school run. Anyway, out of all the above ‘bents, the one I was probably most fond of was the Burrows FWD machine. Although rather ‘Heath Robinson’ in it’s execution, it had great balance and feel, plus I really liked the simplicity of the front wheel drive…. Regarding the Rapto Mid-racer, I can only give my initial thoughts on this new machine as I have only covered around 50 miles so far. Firstly, I don’t think you can describe it as ‘separable’ (ie Moulton style)… it takes a fair bit of jiggling to get the boom into the right position… this afternoon I actually had it slip when I was applying maximum effort and it was a real hassle (at the roadside) to get it set to the right length again. Need to make sure the the bolts are tight. Not something you want to do very often. 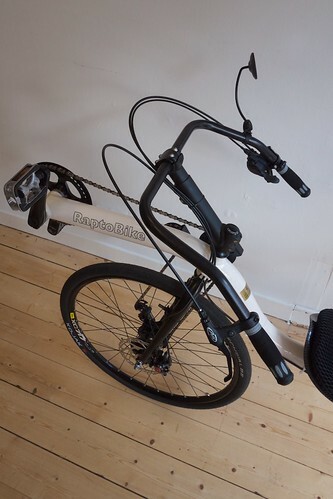 The spec of the bike was based on my previous experience and preferences, for instance I have never got on with ‘hamster bars’, much preferring the wider aero bars, as they give a much more progressive feel through corners. I am using the longer seat support to set the seat angle without recourse to a headrest. 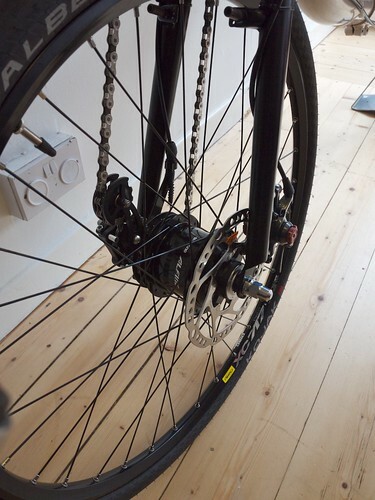 The mountain bike wheels and tyres gives a wider footprint, allowing the bike to roll into corners rather than drop. 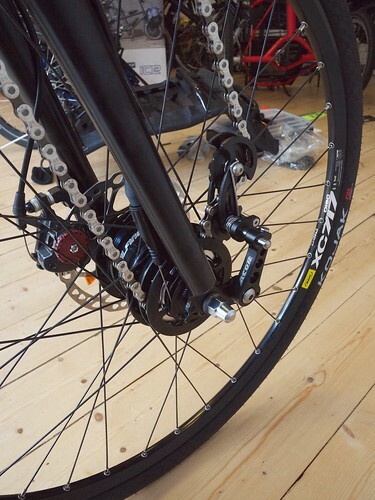 The Alfine hub is great, fit and forget. Oh so handy if you unexpectedly come to a halt and need to change down a gear to get going again (without getting off and winding the pedals around by hand!). All things considered, it compares very favourably with the excellent Bacchetta (over twice the price), although the extra weight of the Rapto is very apparent on the climbs. One thing the CA2 would never do of course, is carry panniers – which is something I am able to do on the Mid-racer. I will write more about my experiences once I have a few more miles under my belt. Thanks for leaving such a detailed comment, Steve!